After Alice Paul, the author of the original Equal Rights Amendment told FFL cofounder Pat Goltz that the early American feminists were pro-life, FFL historians were the first to research and reveal the truth to the feminist and pro-life movements: Without known exception, our feminist foremothers opposed abortion and (like Susan B. Anthony) sought to address the root causes that drive women to abortion. Learn and share our original research and help FFL herald a better day when we fulfill the unrealized dream of Susan B. Anthony. The early feminists, some of whose names are very familiar to you, and others whom you have yet to meet, were overwhelmingly pro-life. 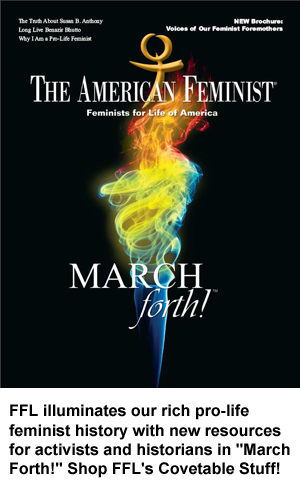 The links below will take you to the PDF file of the selected issue of The American Feminist. Once you’re there, you may either use the arrows at the bottom to take you to the Herstory page or click on the Bookmarks tab on the left and click on the featured feminist’s name. In celebration of Women’s History Month, FFL began a new e-tutorial about the feminists whose conviction, bravery and — sometimes — sheer bravado made it possible for women to vote, own property and serve as legal guardians of their own children. The early feminists worked to protect women and children from abortion and sought to address the root causes of abortion — just as Feminists for Life of America does today. To receive regular news, information about scheduled events, and features like this, please join FFL’s email list. in packets of 50 for your next pro-woman, pro-life event. when they sign up for membership. The Truth About Susan B. Anthony: Did One of America’s First Feminists Oppose Abortion? Susan B. Anthony on the occasion of her 80th birthday, February 15, 1900. Women Deserve Better than Abortion.